Property owners that would like their city parkway trees on the public right of way trimmed or if the tree is in poor condition and would like it considered for removal and replacement need to contact the Public Works Department at 715-258-4421. Once contact has been made with Public Works Department, staff will evaluate the condition of the tree and then schedule maintenance activities as time and resources are available. Tree removal work is generally completed in the winter months. The City of Waupaca municipal code requires that all dead, dying or diseased trees be removed from private properties so they do not affect the public safety of the community. These dead trees present a safety hazard and could potentially damage neighboring properties if not removed. Please be mindful that if a tree has fallen onto power lines, stay away and call Wisconsin Public Service at 1.800.450.7260. If you have any questions, or would like further clarification of the ordinance please contact the City Forester 715.942.9909. 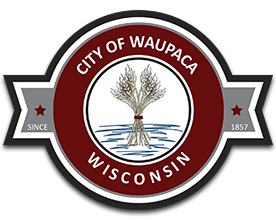 The City of Waupaca orders a variety of trees annually for spring planting with city crews, planting young parkways trees around the city. The City has developed a comprehensive street and park tree inventory and management plan. You may have lost a parkway tree due to old age, damage or disease, or have a location on your parkway that has not had a tree. You can request that a parkway tree be planted on the city right of way in front of your house. Just contact City of Waupaca City Hall at 715-258-4420 and ask to be placed on the City Parkway Tree Planting Request List. Someone from the Waupaca Public Works Department will then contact you to review the requested location and appropriateness of planting a tree there. Items such as tree type, roadway and driveway sight lines, overhead electric, cable and telephone line conflicts and tree spacing will all be reviewed at that time. If the location is approved, you will be placed on the city planting list. Depending on the number of requests and the annual budget, it may be a year or two to plant a tree at an approved planting site. Once planted, the city would ask that you water the planted tree to sustain its growth.